Lesotho is one of the most unique countries on the planet. It’s the southernmost landlocked country, the largest country that’s entirely surrounded by another country (South Africa), and the highest country on Earth (the lowest elevation in Lesotho is 1,400 m (4,593 ft) above sea level!)1. Yet, it doesn’t really show up on too many people’s radar. 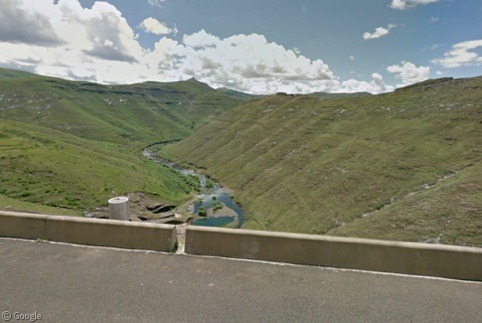 With the arrival of Google Street View imagery this month to Lesotho, it’s time to shed some light on the world’s largest enclave. 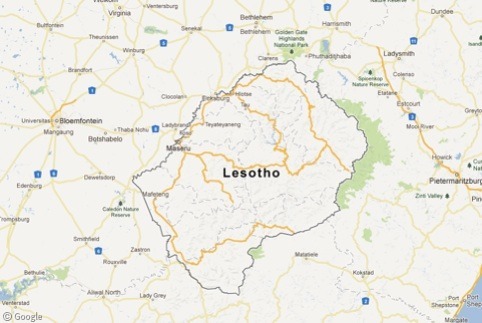 The Kingdom of Lesotho (pronounced li-SU-tu) occupies 30,355 km2 (12,727 sq mi) in the middle of South Africa and gained its independence from the United Kingdom in 1966. 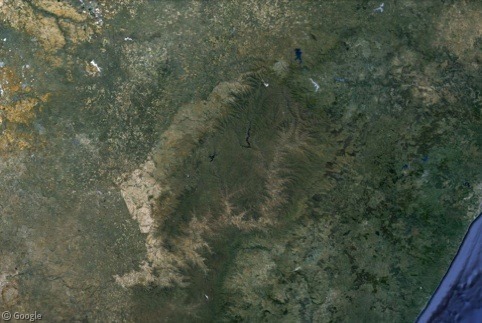 While it’s easily recongisable on a map from being an enclave in the middle of another country, it’s also recognisable from space even without a map due to the large amount of deforestation in Lesotho; two-third’s of the country economy is based in agriculture. Most visitors to Lesotho enter through the capital, Maseru, a city of a quarter-million people which lies directly on the western border. 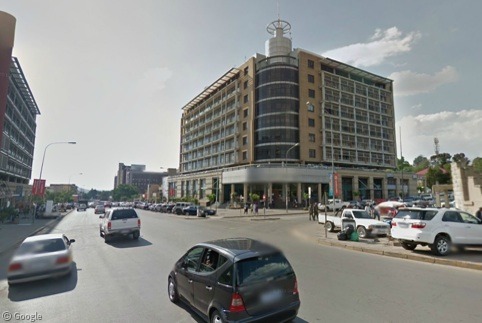 Maseru is easily the largest and most modern city in the country. 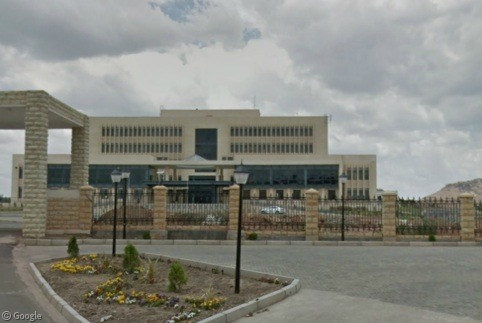 The Lesotho Parliament sits high on a mountaintop in the middle of Maseru. 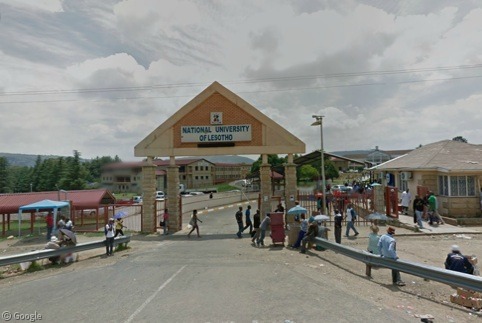 Lesotho’s only university is the National University of Lesotho in the town of Roma. 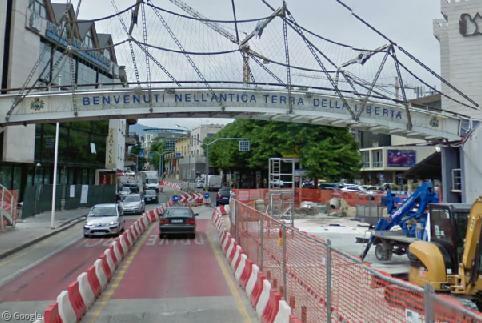 The entrance to the University has become a hot area for businesses and street vendors in recent years. Around 75% of Lesotho’s population lives in rural areas, and most of the population is concentrated in the lowlands along the western border. A common sight along the roadside is people gathered around bus shelters made from corrugated steel waiting for the next minibus. Often attached to these are public telephone booths. Another common sight is the rather staggering amount of billboards and signs along the roadside advertising AIDS prevention services and, even more distressingly, funeral services. Adult prevalence of AIDS in Lesotho is 28.9% according to the UN; the third-highest rate in the world. 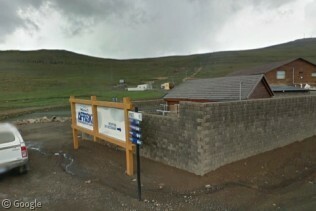 Because Lesotho’s population is concentrated in the lowlands, the mountain highlands were largely left alone by Street View. 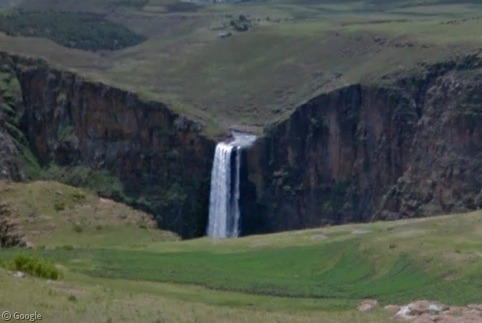 Still, the cameras did capture some of the spectacular scenery, such as at Maletsunyane Falls. At 192 m (630 ft), it’s the highest single-drop waterfall in all of southern Africa. The highlands are also the source of Lesotho’s major export: electricity. 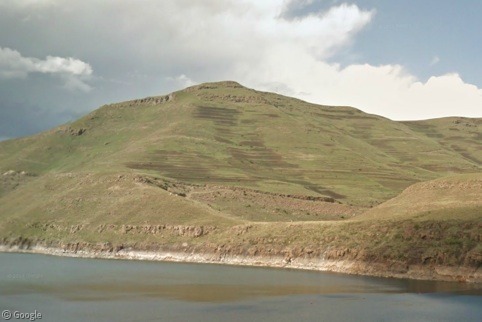 The Lesotho Highlands Water Project exports electricity to South Africa generated from two hydroelectric dams in the centre of the country, Mohale and Katse. 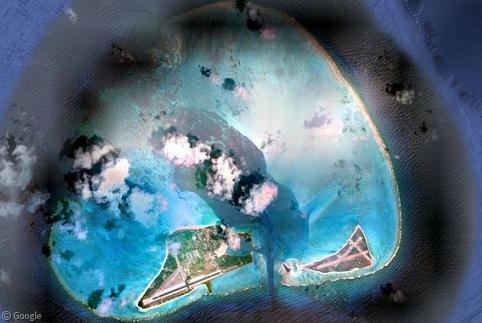 The project is scheduled to add three more dams in the coming years. At 145 m (476 ft), Mohale Dam is Africa’s tallest rock-fill dam, while Katse Dam is the second-largest dam in all of Africa, standing 185 m (607 ft). As seen from the tops of Katse and Mohale, even in the middle of the highlands the forests have long been stripped bare. Soil erosion caused by deforestation has ruined much of the country’s land; a major problem in a place where less than 11 percent of the land is suitable for growing crops. It’s not all doom and gloom, however. Thanks to its high altitude, Lesotho is home to one of Africa’s few ski resorts. The cameras came by in the middle of summer, though, so no snow is present. 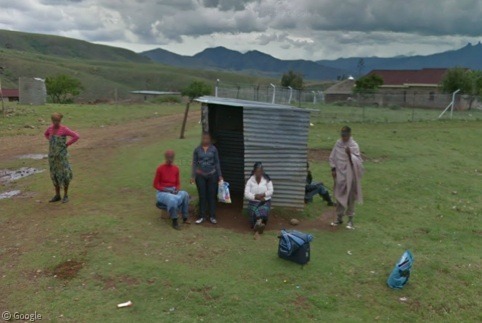 The Street View cameras managed to capture quite a few slices of bucolic rural life in Lesotho. 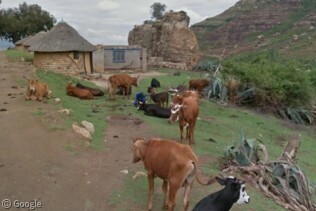 Here, we see a farmer with his cattle (and associated cattle by-products) in front of his traditional Sotho hut, a group of children who decided to chase after the Street View car down this dead-end road, and a traditional village so remote that it doesn’t even have roads. Hopefully, we will get to see even more of rural Africa in the coming months. South Africa and Botswana are already on the roster, and Swaziland is scheduled to be added soon. Sorry for the grammar Nazism, but you can’t properly use the phrase “most unique.” Unique is an absolute, and needs no modifications.